Vacation Bible School (VBS) is a free opportunity for all the children can come together for a week of fun and exciting adventures as they learn about God’s great love for them in Jesus Christ, through singing, prayer, crafts, drama, and snacks. 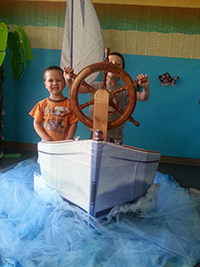 VBS is for everyone! 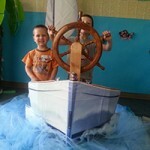 While VBS focuses on preschool-6th grade children, it also involves a lot of different ages in putting it all together. Youth assist adults in leading the small groups, and all the stations require a variety of talents. Spread the Word, all are welcome. At Camp Discovery, kids have fun as they explore the Bible, make new friends, sing songs, and learn how Jesus works through them in their everyday lives. Campers discover 5 Bible truths that excite and challenge them. They will discover that Jesus gives them courage. ( ) He gives them wisdom. ( ) He saves them. ( ) He gives them Faith. ( ) And he gives them his love to share. ( ) Jesus, their True North, gives them the wisdom and the courage to step out in faith and serve—whether they’re at school, playing with friends, or helping out at home. 17:1 Now the Philistines gathered their armies for battle. And they were gathered at Socoh, which belongs to Judah, and encamped between Socoh and Azekah, in Ephes-dammim. 2 And Saul and the men of Israel were gathered, and encamped in the Valley of Elah, and drew up in line of battle against the Philistines. 3 And the Philistines stood on the mountain on the one side, and Israel stood on the mountain on the other side, with a valley between them. 4 And there came out from the camp of the Philistines a champion named Goliath of Gath, whose height was six cubits and a span. 5 He had a helmet of bronze on his head, and he was armed with a coat of mail, and the weight of the coat was five thousand shekels of bronze. 6 And he had bronze armor on his legs, and a javelin of bronze slung between his shoulders. 7 The shaft of his spear was like a weaver’s beam, and his spear’s head weighed six hundred shekels of iron. And his shield-bearer went before him. 8 He stood and shouted to the ranks of Israel, “Why have you come out to draw up for battle? Am I not a Philistine, and are you not servants of Saul? Choose a man for yourselves, and let him come down to me. 9 If he is able to fight with me and kill me, then we will be your servants. But if I prevail against him and kill him, then you shall be our servants and serve us.” 10 And the Philistine said, “I defy the ranks of Israel this day. Give me a man, that we may fight together.” 11 When Saul and all Israel heard these words of the Philistine, they were dismayed and greatly afraid.